While not much of a military history buff, I do enjoy compelling stories of people and events from past conflicts. A new collection of such fascinating stories, Narrow Escapes of World War II has recently been shown on the Military Channel and is now available on as a 4 DVD set. We meet some charismatic characters in the stories from the DVDs. My favorite was the eccentric Charles Onde Wingate from Episode 3, "Wingate and the Chindits." Wingate belonged to a religious group that was seen as somewhat odd, so that made him the object of bullying during his school days. Nevertheless, he became a much admired and respected leader in the British army. He trained his troops to fight and survive in the jungle. Their mission was to sabotage the railway in Burma to keep the Japanese from being able to use it to transport troops and supplies. The men and their mules managed to complete the mission, which included crossing a dangerous river, but were then faced with attempting to evacuate back to friendly territory. While everything didn't go as planned, Wingate's methods and tactics influenced special operations training for many generations. The most poignant story was one I had never heard of before, the 333rd Field Artillery Battalion, a group made up entirely of African-American soldiers. This was documented in Episode 4, The Black Battalion. Many of the soldiers from this battalion were from northern states, and were shocked to experience racism for the first time in the military. They were invariably led by white commanders who gave them the most menial tasks to complete. The 333rd was sent to a supposedly quiet area of the Belgian front. However, military commanders didn't realize that Hitler was planning a march to Antwerp in order to target one of the few ports still under Allied command. As the conflict began to get heated, Allied troops began to retreat, with the men of the 333rd providing cover for the retreating soldiers. Many of this unit were captured or forced to surrender. Eleven soldiers from the group became separated from their unit and took refuge with a local farm family. The family was more than willing to hide the men, but word got out that they were there, and they were rounded up and marched off by German soldiers. Later, it was discovered that the 11 men were horribly tortured and killed by their captors. No official recognition of their sacrifice was made by the US government, but in 2004 a monument was erected near the area where they were killed in Belgium to commemorate the "Wereth Eleven." This set includes 13 gripping episodes covering a wide range of locations and individuals who made lucky escapes during the war. There is also a 16 page viewer's guide with information about the war as it was fought in Europe and Asia, as well as an overview of the "ways of warfare," highlighting newfangled tactics used in WWII such as the blitzkrieg, aircraft carriers and commandos. Something that really surprised me from the series was how often soldiers were deployed for daring and involved missions, with little or no thought put into how they were going to be returned to safety after completing the missions. I hope that today's military commanders put a little more thought into completing missions safely than their predecessors did! Anyone with an interest in history or even fans of suspense will enjoy this exciting look at how some colorful characters managed to make their escapes from behind enemy lines during WWII. The stories really come alive with archival footage, modern re-enactments, and commentary by some of the men who participated in the events. 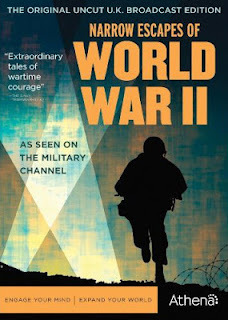 Disclaimer: I received a copy of Narrow Escapes of World War II from Acorn Media.